Jump into this classic Christmas tale to help Scrooge mend his greedy ways and win a princely Christmas fortune. Click here to play! All of the most memorable characters of this Christmas classic are on these reels, and you can kick the story off by spinning in as many Scrooge logos as possible. This money making symbol is the top paying icon of the game and will bring in up to 6,000 coins. Next up is Scrooge himself. Spin in this grisly old man to pick up a max of 600 coins. You’ll also want to watch out for the three ghosts. Each of these symbols will payout handsomely with the Ghost of Christmas Past paying out up to 400 coins, the Ghost of Christmas Present bringing in up to 350 coins, and the Ghost of Christmas Future grabbing up to 300 coins. Jacob Marley and Tiny Tim are also here along with safes, moneybags, clocks, ledgers, and keys. The ominous doorknocker not only signals the arrival of each character, but it’s also a scatter symbol. It will multiply your total bet to result in major wins as well as trigger a special bonus feature in which you can pick up some major cash prizes! So, become one with this classic Christmas tale and help Scrooge mend his ways for a chance to win plenty of cold, hard cash. The golden doorknocker is a scatter symbol. Spin three or more anywhere on the board to multiply your total bet by 2, 10, or 200 respectively. It will also trigger a bonus feature. The Scrooge logo is a wild symbol. It will replace all others, excluding scatters, to bring in more wins. 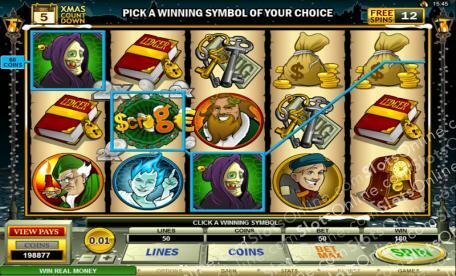 It will also double all payouts when it appears in a winning combination. Three golden doorknockers will trigger the Xmas Dinner bonus round. During this game you will have to choose a meal for each hungry ghost to win up to 10,000 coins.